In a medium saucepan, combine 4 cups of water with the chicken, salt, star anise, sliced ginger, and garlic. Slowly bring to a simmer over low heat, about 10 minutes. (If brought to a boil too quickly, the chicken will become tough.) Simmer for 10 minutes, then remove from the heat, cover, and let sit for 10 minutes. Remove the chicken from the liquid, and strain the solids, reserving the poaching liquid. When cool enough to handle, shred the chicken, then set aside. In a medium Dutch oven or other heavy-duty pot, heat the oils over medium-low heat until shimmering. Add the shallots, shiitake, and chopped ginger, and cook, stirring, until the shallots soften, about 2 minutes. Add the wine and cook, stirring, to deglaze the pan, 30 seconds. Add the stock, soy sauce, and reserved poaching liquid, and bring to a simmer over medium-high heat. Stir in the radish, bok choy, sambal oelek, and shredded chicken, and simmer lightly until the bok choy is crisp-tender, about 2 minutes. 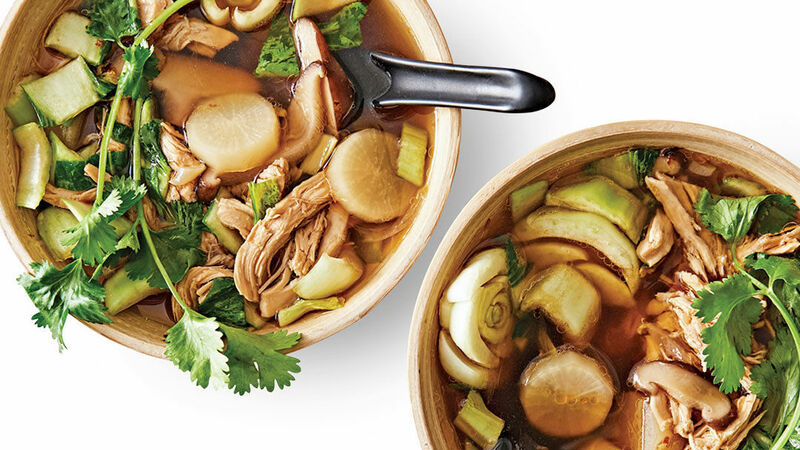 Divide the soup among 4 serving bowls, and garnish with the cilantro sprigs.